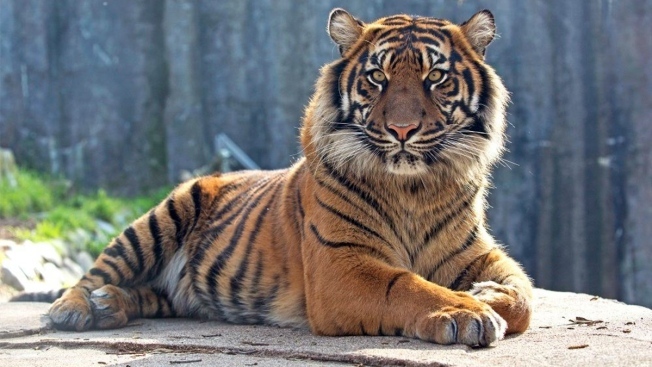 Jillian, a 220-pound Sumatran tiger, is a member of the smallest subspecies of tigers left on Earth. Jillian, a 3-year-old Sumatran tiger at the San Francisco Zoo. A rare tiger celebrated her third birthday at the San Francisco Zoo on Wednesday. Jillian, a 220-pound Sumatran tiger, is part of the smallest subspecies of tigers that still exist — largely in forests on the Malaysian Peninsula. Described as still a "kitten at heart," Jillian still loves to play as she did in her younger years. She also still gets along with her mother Leanne, something officials said on the zoo's Facebook page is "amazing" because she's now a full-grown tigress. The occasion of Jillian's birth gave the zoo an opportunity to draw attention to their participation in the AZA Species Survival Plan for Sumatran tigers, which is part of a tiger conservation campaign to protect the scant approximation of 3,200 tigers that exist today in Asia. Amateur video shot at the zoo three years ago revealed that Jillian has been a big fan of playing in hay since Day 1.